On Sale Now! Free Shipping Included! Save 2% on the Pyle Secure Anti Theft Tablet Kiosk with Key + Lock - Display iPad Android Device Heavy Duty Mounted Enclosure by Pyle at The GM Sign In. MPN: PMKSPADLK48. Hurry! Limited time offer. Offer valid only while supplies last. 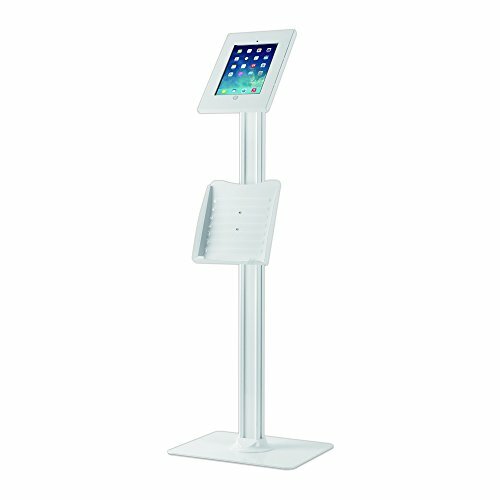 Safely and securely place your iPad on display. The Pyle anti-theft iPad floor stand works with iPad generations 2, 3, 4, iPad Air, and iPad Air 2. Safely and securely place your iPad on display. The Pyle anti-theft iPad floor stand works with iPad generations 2, 3, 4, iPad Air, and iPad Air 2. Rest assured with regard to the safety of your device when you install the unit in public locations. Allow convenient access to your tablet when installed in high traffic areas like front desks, lobbies, customer counters or showrooms. The iPad stand includes an internal cable management system and tamper-proof locking mechanism, with included key, to add an extra line of safety. Additional features include adjustable device frame for landscape or portrait mounting, Home Button accessibility, along with a secondary height adjustable device stand / bookshelf. The kit includes all necessary mounting hardware and brackets for a professional and clean installation on any floor or flat surface.